Endoscopic image of a gastric ulcer. Source: Wikipedia. Ulcer development 1. 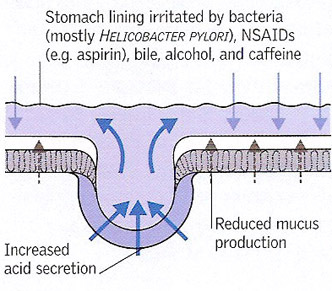 Glands in the lining of the stomach secrete hydrochloric acid and the enzyme pepsin to help digest food. 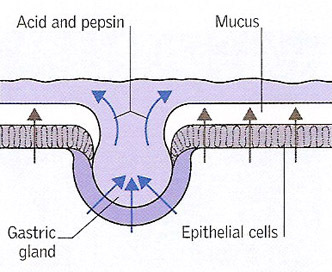 Other cells secrete a protective layer of mucus that prevents the acid from eating into the GI lining. Ulcer development 2. Most peptic ulcers are due to bacterial infection of the stomach lining, which damages its mucus layer (making it vulnerable to acid attack) and the cells that control excess acid production. Ulcers can also be caused by NSAIDs or excess alcohol combined with excess production of acid. Smoking is another important irritant factor. Ulcer development 3. 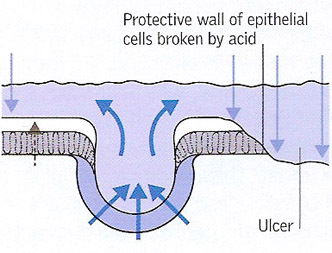 If damaging influences overcome the protective factors in the stomach or duodenal lining, the mucus layer and mucus-secreting cells are eroded and an ulcer forms. A peptic ulcer is a raw area that occurs in the gastrointestinal tract as a result of erosion by acidic gastric juice. Peptic ulcers may occur in the esophagus (gullet), stomach, or duodenum. Rarely, they develop in the jejunum (as occurs in Zollinger-Ellison syndrome) or in the ileum (as may occur in Meckel's diverticulum). A peptic ulcer in the stomach is called gastric ulcer. A person diagnosed with a gastric ulcer should be especially cautious if taking blood thinners. There have been several cases of pradaxa gastrointestinal bleeding emerging. Pradaxa, among other blood thinners, can increase the chance of major bleeding within the gastrointestinal tract, and should therefore be avoided by people suffering from any type of ulcer or intestinal disorder. Peptic ulcers, which may be single or multiple, usually measure about 10 to 25 mm across and about 0.25 mm deep. The typical symptom is a gnawing pain in the abdomen when the stomach is empty. The hydrochloric acid and pepsin released from the stomach wall, which help break food down, would quickly eat away the stomach and duodenum if other cells in the stomach lining didn't secrete a protective mucus. If this protective coating of mucus breaks down, the result is inflammation of the stomach wall (gastritis) or an ulcer. Most ulcers occur in the first layer of the inner lining. A hole that goes all the way through the stomach or duodenum is called a perforation and is a medical emergency. The most common cause of such damage is infection of the stomach by bacteria called Helicobacter pylori (H. pylori). Most people with peptic ulcers have these bacteria living in their gastrointestinal tract. Yet, many people who have such bacteria in their stomach don't develop an ulcer. Regular use of aspirin, ibuprofen, naproxen, or other non-steroidal anti-inflammatory drugs (NSAIDs). Taking aspirin or NSAIDs once in awhile is safe for most people. Smoking cigarettes or chewing tobacco. Being very ill, such as being on a breathing machine. People with Zollinger-Ellison syndrome have a tumor in the pancreas that releases high levels of a hormone, which causes an increase in stomach acid leading to stomach and duodenal ulcers. In some people, there is a strong family history of peptic ulceration. Psychological stress, although probably not a prime cause, may play a part in making an existing ulcer worse. The incidence of gastric ulcers is about the same in men and women, but more males than females suffer from duodenal ulcers. Middle age is the most likely time for stomach or duodenal ulcers to develop, although the peak age for the development of duodenal ulcers is somewhat earlier than the peak age for gastric ulcers. The lining of the duodenum is constantly at risk of erosion from acid produced by the stomach wall. The lower esophagus is at risk only when reflux of acid juice from the stomach occurs (acid reflex). Peptic ulcers in the jejunum occur only when there is a massive outpouring of gastric acid. In Meckel's diverticulum, a peptic ulcer may develop if misplaced gastric lining grows in the diverticulum. Many people found to have a peptic ulcer suffer no symptoms, but a greater number complain of a burning or gnawing pain in the abdomen, which sometimes wakes them at night. The pain of a duodenal ulcer is often relieved by eating, but usually recurs a few hours later. The most common complication of a peptic ulcer is bleeding from the ulcer. Sever bleeding results in hematemesis (vomiting of blood) and melena (black feces), and is a medical emergency. Chronic bleeding may cause iron-deficiency anemia. Rarely, an ulcer may perforate (make a hole in) the wall of the digestive tract and extend to the pancreas, usually causing pain that extends through to the back. If digestive juices leak through the perforation or if the perforation is on the front wall of the duodenum, the juices may cause peritonitis (inflammation of the abdominal lining), producing sudden, severe pain and requiring emergency hospital admission. Chronic ulcers can cause extensive scarring of the stomach or duodenum, which may narrow the outlet of the stomach into the duodenum (a condition called pyloric stenosis) and thus obstruct the passage of food. The may cause vomiting and rapid weight loss. 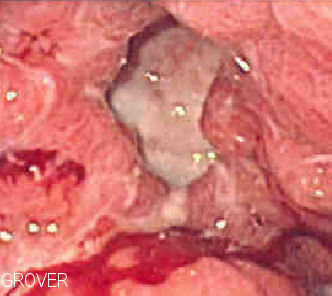 A small number of gastric ulcers are malignant and should be removed as soon as they are diagnosed. Esophagogastroduodenoscopy (EGD) is a special test performed by a gastroenterologist in which a thin tube with a camera on the end is inserted through your mouth into the GI tract to see your stomach and small intestine. During an EGD, the doctor may take a biopsy from the wall of your stomach to test for H. pylori. Upper GI is a series of X-rays taken after drink containing barium sulfate (see contrast medium). Where an ulcer is present without an H. pylori infection, or one that is caused by taking aspirin or NSAIDs, a doctor will likely prescribe a proton pump inhibitor for 8 weeks. This type of medicine may also prescribed if a patient has to continue taking aspirin or NSAIDs for other health conditions. If a peptic ulcer bleeds a lot, an EGD may be needed to stop the bleeding. Surgery may be needed if bleeding cannot be stopped with an EGD, or if the ulcer has caused a perforation. Peptic ulcers tend to come back if untreated. Medications, taken as directed, will clear up an H. pylori and make it much less likely than another ulcer will occur.